Lovey allows herself to be chased from her childhood home in Oxford, Mississipi by her older sister Bitsy’s inexplicable animosity. Though she calls foul on sibling rivalry, her parents don’t back her up, making Lovey feel damaged. When their mother’s garden shed burns to the ground after their friends Fisher and Finn barely make it out, Bitsy blames Lovey and no one protests, leaving her alone for years wallowing in the injustice. Bitsy uses Finn’s injuries to fuel Lovey’s guilt, prompting her move to another state, another life, away from his brother Fisher, who asked Lovey to marry him. Emotions run rampant through Lovey as she tries to balance her current life and the one she ran scared from decades ago. Her parents convince her to return home for their 50th wedding anniversary party. She complies, facing her lost love and antagonistic sister. When she’s called to return to work to resolve a hostile takeover by the boss of her ad campaign project, her father changes her mind when he confesses that her mother is terminally ill. She stays, determined to treasure every last moment with her mother, making a truce with her sister, and dealing haphazardly with Fisher’s current “it’s complicated” relationship status. 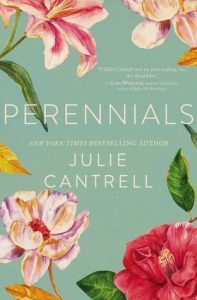 Lovey continues to bond with her mother over their shared love of gardening, with life lessons inspired by gardening and favorite local writers Welty and Faulkner sprinkled throughout the book by both parents. Religious themes run a bit strong in this story and can be distracting, assuming that readers are Christian and accepting of religiosity as part of the lessons. Lovey makes a breakthrough with her father after a particularly hurtful encounter with Bitsy, which starts her healing process. She is home. This is her home. Everything comes together, albeit some of it a bit too easily, as there are decades of pent-up hurt to be worked through, especially for the sisters. This novel lays a family bare across the lush backdrop of a Mississippi farm, with floral imagery cascading over it all, a tragic history made bigger by time, southern literary greats explored, and long ago loves who may not be lost.